Each week, we compare all 32 NFL teams using our Football Relativity comparison. On the comparison, the 10 level is reserved for the best teams, and the 1 level for the worst. We’ll note throughout where teams have moved up or down from last week. 10 – Green Bay Packers – The Packers jumped out to a quick lead and cruised to a 24-3 victory over the lowly Rams. They’re playing in top form right now, and the offense is so explosive that it’s going to be hard for lower-tier teams to pull an upset. 9 – Baltimore Ravens, New England Patriots, New Orleans Saints – We discussed the Saints in detail in this game post. The Patriots needed a two-minute drill to score the game-winning touchdown against the Cowboys, but the fact that they pulled out a win against a solid team is a credit. So is the Ravens’ 29-14 win over the Texans, which demonstrates just how good the Ravens are. Like the Packers, the Ravens and Saints have games they should win this week, while the Pats are on bye. 8 – Detroit Lions, Pittsburgh Steelers, San Diego Chargers – The Chargers were on bye. They travel to face the Jets this week in a game that could impact the AFC wild-card race. The Lions fell in a tough home game to the 49ers, and now they must bounce back against the Falcons. It’ll be curious how Detroit responds to its first loss of the year. The Steelers weren’t impressive, but they held on for a 17-13 win over the Jaguars. If they can take care of business in Arizona this week, the margin of victory won’t matter nearly as much as piling up wins to keep pace with the Ravens in the AFC North. 7 – Atlanta Falcons, Buffalo Bills, Houston Texans, New York Giants, New York Jets, Oakland Raiders, San Francisco 49ers (UP A LEVEL), Tampa Bay Buccaneers – We discussed how the 49ers struck gold in Detroit in Rise/Sink/Float, and we discussed the Bills/Giants game in this post, and we talked about the Buccaneers’ big win in this post. The Falcons beat the Panthers 31-17 in a game they had to have. Now the Falcons need to steal a win in Detroit to keep pace in the NFC South. The Texans lost 29-14 in Baltimore and now face a trip to Tennessee that will have huge bearing in the AFC South. The opportunity the Texans have in the division could slip away with a third straight loss. The Raiders took care of business at home against Cleveland, and if they can beat the Chiefs at home this week, they’ll be firmly in the AFC West race with the Chargers. The Jets didn’t win any style points but did beat the Dolphins on Monday night. Now they must face the Chargers at home. 6 – Chicago Bears, Dallas Cowboys, Philadelphia Eagles – We covered the Cowboys in Rise/Sink/Float. The Bears beat down the Vikings on Sunday night, and seemed to start to fix some of their protection problems. That’s a big step forward. Now they travel to London to face the Buccaneers in a game that could impact the NFC wild card race. The Eagles beat the Redskins 20-13, and while it wasn’t a dynamic performance, at least it was a win. At 2-4, the Eagles are still hovering on the fringes of the NFC East race as they head into their bye. 5 – Cincinnati Bengals (UP A LEVEL), Tennessee Titans, Washington Redskins (DOWN A LEVEL) – The Redskins blew a golden opportunity at home against the Redskins, and Rex Grossman’s awful play created a quarterback controversy. A trip to Carolina this week is no gimme, and another loss would completely reverse all the early-season momentum. The Titans were on bye leading up to what is now a key AFC South battle against the Texans in Nashville. The Bengals got another win to move to 4-2 heading into their bye. The Bengals have had a little help from the schedule, but the results are good enough that they’ll be a factor moving into midseason. 4 – Cleveland Browns, Seattle Seahawks – The Browns lost in Oakland and need to get back on track at home against the Seahawks, who were on bye. At 2-3, both teams can still harbor playoff hopes, but this becomes a key chance to get a win this week. 2 – Arizona Cardinals, Jacksonville Jaguars, Minnesota Vikings – The Cardinals were on bye. The Jaguars lost in Pittsburgh, but the effort was better than in recent weeks. The Vikings, on the other hand, put up a stinker in Chicago and now must answer questions about switching quarterbacks from Donovan McNabb to Christian Ponder. 1 – Miami Dolphins (DOWN A LEVEL), Indianapolis Colts (DOWN A LEVEL), St. Louis Rams – We discussed the Colts in Rise/Sink/Float. The Rams lost 24-3 in Green Bay, which is no surprise. They hope adding WR Brandon Lloyd will help an offense that desperately needs it. The Dolphins came off their bye and lost to the Jets to fall to 0-5. The quarterback situation with Matt Moore is a major problem. Once the lockout ended, an offseason of trades was compressed into just a few weeks, and during the flurry we saw several big names move. In this post, Football Relativity compares the trades in terms of significance, with the most significant trade on the 10 level and the least significant on the 1 level. We’ll update this post until the start of the regular season. 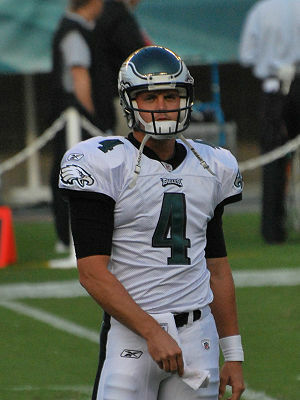 10 – Eagles trade QB Kevin Kolb to Cardinals for CB Dominique Rodgers-Cromartie and a 2012 sixth-round pick – The Cardinals locked in on Kolb as their quarterback of the future early in the offseason. He’s a West Coast-style of quarterback who gets the ball out quickly and can move around in the pocket. But Kolb has been fragile in his career, and the Cards coaching staff will have to alter their system to fit his skills. Arizona is banking heavily on Kolb, not just because what they gave up on the trade but also with a five-year, $63 million contract extension that includes $20 million in guaranteed money. It’s a high price, but the move gives Arizona hope. Now Kolb must live up to his promise. Philadelphia was able to trade a former second-rounder and get not only a second-rounder back but also acquire Rodgers-Cromartie, a former first-round pick who has played well thus far in his career. DRC fits an area of need for the Eagles, and playing across from Asante Samuel should help his development. Andy Reid got a good deal; now he must find a backup quarterback to protect against a Michael Vick injury. 7 – Redskins trade DT Albert Haynesworth to Patriots for 2013 fifth-round pick – We discussed this trade in this post. 6 – Bears trade TE Greg Olsen to Panthers for third-round pick – Olsen, a former first-round pick, has been pretty productive for the Bears over his career, but offensive coordinator Mike Martz doesn’t really want to feature a tight end. As ESPN’s Kevin Seifert said, it’s a choice of scheme over skills. Olsen showed in the playoffs against Seattle last season that he can be a game-changer, and now he moves to a Panthers offense that wants to feature the tight end. He’ll compete with Jeremy Shockey in the short term, but Olsen is the long-term answer at the position. Carolina recognized that and gave Olsen a four-year, $24 million extension with $10 million in guaranteed money. Olsen will help the passing game and give receivers Brandon LaFell, David Gettis and Armanti Edwards even more space to develop. 5 – Saints trade RB Reggie Bush to Dolphins for S Jonathon Amaya (undisclosed draft picks also involved) – Instead of paying Bush a major balloon payment, the Saints signed Darren Sproles and dealt Bush to Miami. The Saints have depth at running back, so they can do without Bush. Amaya brings them a backup safety who’s a special-teams ace. In Miami, Bush will have a chance to play an even bigger role than he had in New Orleans. If Bush can be the pass-catcher to pair with rookie Daniel Thomas, the Dolphins could have a nice backfield. But Bush’s inconsistency and injury problems in his NFL career make him a curious bet. Miami isn’t paying a huge price for Bush – $10 million over two years – but it’s still a risk to build their running game around him. 4 – Bengals trade WR Chad Ochocinco to Patriots for 2012 fifth-round pick and 2013 sixth-round pick – Ochocinco had fallen out of favor in Cincinnati because his play had slipped a little and his off-field antics distracted a lot. Now he goes to a Patriots team with a notoriously strong locker room. As with Haynesworth, the Patriots believe their culture can get the best out of Ochocinco’s talents. So the Pats gave up just a little to put Ochocinco outside, hoping he will provide a nice addition to Wes Welker and a young group of receivers and tight ends. It’s a bet worth taking, given the scant price. The Bengals move on to a young group of receivers that’s headlined by rookie A.J. Green but that is also surprisingly deep with talent. 4 (con’t) – Redskins trade QB Donovan McNabb to Vikings for 2012 sixth-round pick and conditional 2013 sixth-round pick – Washington paid a significant price to bring McNabb into town last year, but Mike Shanahan quickly decided that he wasn’t the answer. So they got what they could back for McNabb. Overall, the transaction is really one-sided, but at least Washington got something in return. McNabb goes to Minnesota to be the Week 1 starter, but rookie first-rounder Christian Ponder will take the job quickly. It’ll be interesting to see how McNabb reacts to becoming a backup for the first time in his career. If he plays well, he could find another starting shot, but the signs are pointing downward on his career. 4 (con’t) Bills trade WR Lee Evans to Ravens for 2012 fourth-round pick – After cutting Derrick Mason, the Ravens lacked a veteran receiver to pair in the starting lineup across from Anquan Boldin. So instead of banking on rookies Torrey Smith and Tandon Doss to be ready to go right away, the Ravens gave up a fourth-round pick to acquire Evans from the Bills. Evans, a former first-round pick, has played all but three games in his seven-year career, and he consistently averages more than 15 yards per catch. He remains a quality deep threat, which makes him a nice complement to Boldin. Evans wasn’t going to take the Bills over the top, and as Buffalo develops youngsters Stevie Johnson, David Nelson, and Marcus Easley, moving Evans and his salary makes sense. But in Baltimore, he’s an essential piece of the puzzle who can keep the passing game viable – something that was a big question before the trade happened. Kudos to the Ravens for recognizing a hole in their lineup and moving to address it. 3 – Eagles trade DT Brodrick Bunkley to Browns for 2012 fifth-round pick Broncos for conditional 2013 draft pick- After signing Cullen Jenkins, the Eagles gave up on Bunkley, a former first-round pick who was slated to make more than $5 million this season. Bunkley started from 2007-09 and played pretty well, but last year was a disappointment as he lost his starting job. Still, he has talent, and his ability to play defensive tackle in the 4-3 makes him attractive. The Eagles originally had a deal with the Browns, but Bunkley balked at reporting to Cleveland. So that trade was voided, and the Eagles dealt Bunkley to the Broncos for a conditional 2013 pick. Bunkley will help the Broncos transition to a 4-3. 3 (con’t) – Cardinals trade RB Tim Hightower to Redskins for DE Vonnie Holliday and conditional draft pick – Hightower has been a productive back in Arizona despite not having dynamic physical gifts. But after drafting Ryan Williams to pair with Beanie Wells, the Cards didn’t have a lot of carries waiting for Hightower. So they dealt him to the Redskins, where he will compete with holdover Ryan Torain and rookie Roy Helu for playing time. Hightower is more proven than those guys, and his ability to play as a third-down back should allow him to find a role. In return, the Cardinals get a draft pick that’s conditional on Hightower’s playing time in Washington along with veteran DE Vonnie Holliday, who is long in the tooth but still pretty productive entering his 14th season. 3 (con’t) – 49ers trade S Taylor Mays to Bengals for 2013 seventh-round draft pick – Mays, a former second-round pick, fell out of favor in San Francisco last year and lost all defensive playing time. He has incredible physical skills but doesn’t play instinctively enough for the Niners’ tastes. Still, the talent was worth acquiring for the Bengals, who have little depth at safety. If the Bengals can get the most out of Mays, he’ll be well worth the miniscule draft-pick cost. 2 – Broncos trade WR Jabar Gaffney to Redskins for DE Jeremy Jarmon – The Broncos were likely going to cut Gaffney, so dealing him to Washington makes sense. Jarmon, who got little playing time in Washington, fits as a 4-3 defensive end prospect, and Denver needs all the help it can get in moving to that system. Maybe the former third-round supplemental draft pick can pan out with a change of scenery. Gaffney becomes a veteran receiver who, along with Donte Stallworth, will try to find a role behind Santana Moss in Washington. But acquiring Gaffney also blocks the Redskins’ rookie receivers to some degree. 2 (con’t) – Seahawks trade CB Kelly Jennings to Bengals for DT Clinton McDonald – Jennings, a five-year vet, moved back into the starting lineup last year for 14 games and had a decent season. Still, he is little more than an average corner. The Seahawks give up on him and hope that he doesn’t emerge as a player the way Josh Wilson did after Seattle traded him last year. In Cincinnati, Jennings could emerge as a starter to replace Johnathan Joseph, and at the least he can help as a nickel or dime back. In return, the Seahawks get McDonald, a 2009 seventh-round pick who moved up from the practice squad midway through last season and became a backup for the Bengals. He’s little more than a rotation player for the Seahawks. 2 (con’t) – Packers trade FB Quinn Johnson to Titans for undisclosed draft pick – With starter Ahmard Hall suspended, the Titans dealt for Johnson, a massive fullback who didn’t truly fit the Packers’ system. With John Kuhn in place and B.J. Raji available as a massive blocker, the Pack didn’t need Johnson, so getting a future pick for him makes sense. 2 (con’t) – Jets trade S Dwight Lowery to Jaguars for conditional draft pick – The Jaguars haven’t had a ton of secondary depth lately, so even after adding Erik Coleman and Dawan Landry in free agency, more depth is needed. Lowery, who can play safety or a slot corner, should be a top-6 defensive back for the Jags, maybe more. But he was bottled up with the Jets, so trading him makes sense. 1 – Rams trade OG John Greco to Browns for a conditional 2012 seventh-round pick – Greco, a third-round pick in 2008, never found his way into the Rams lineup, playing 26 games and starting just four in his three season there. Now he gets another chance to make an impact in Cleveland. 1 (con’t) – Packers trade OG Caleb Schlauderaff to Jets for undisclosed conditional draft pick – Schlauderaff, a sixth-round pick, has an attitude but not a ton of skill. Still, if the Jets liked him in draft prep, he’s worth a look, especially with key backup Rob Turner injured. The Packers’ depth again allows them to add a future pick. Now that the lockout is almost over, it’s time to start previewing the upcoming season. And in our first post, we want to take a macro look at the league and identify the one player who will leap into the public consciousness this year. Our pick? 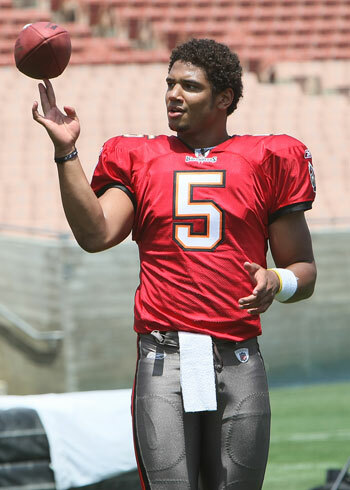 Tampa Bay QB Josh Freeman. Just two years ago, Freeman was viewed as a project pick in the first round. The Buccaneers seemingly liked him more than any other NFL team, and so they picked him higher (17th overall) than most other teams would have. And as a rookie, Freeman looked a bit like a project, waiting till midseason to take over the starter role. He won his first game as a starter (an upset over the Dolphins), then lost five straight before two late-season wins over the Seahawks and Saints. In his 10 games, he completed just 54.5 percent of his passes and had 18 interceptions to 10 TD passes. But last season, Freeman took over the Bucs as his own with a star-making season. He led the surprising Bucs to a 10-6 record and had 25 touchdowns with just six interceptions – a remarkable ratio for any player and especially for a starter in his first full season. He threw for 3,451 yards and ran for 368, showing remarkable speed given his massive 6-foot-6, 248-pound frame. Even more impressively, Freeman put up those massive numbers not with a veteran crew around him but with a baby-faced crew – RB LaGarrette Blount and WRs Mike Williams and Arrelious Benn were all rookies. *Personality – What the Bucs figured out – or made a correct guess about – is that Freeman has the personality required to be a franchise quarterback. He is personable but also able to challenge his teammates to perform, which is essential for a top quarterback. That’s especially important in Tampa, because both Blount and Williams had troubled tenures in college. The Bucs can’t afford them to slip up (as CB Aqib Talib and S Tanard Jackson have). But if Freeman can help them stay in line, the Bucs will have a talented group around their quarterback. *QB vaccuum – With Brett Favre (hopefully) done for good, Donovan McNabb probably done as an NFL starter, and Carson Palmer possibly sitting out the season, there’s space for quarterbacks to emerge as stars. And our money is on Freeman to do this – even more than guys like Matt Ryan or Joe Flacco. If Freeman has another massive season, he’ll break through and become at least a Philip Rivers-level star. A strong playoff push would take him even further up the Q-rating totem pole. *Style of play – Freeman’s ability to run as well as pass makes him a more exciting player than a fellow young QB like Ryan. Freeman will make big plays on his own as well as by finding teammates, and those highlight type of plays will add to his profile. Now is Freeman’s time. We hope he likes the spotlight, because it’s going to be focused on him this season and for many to come. 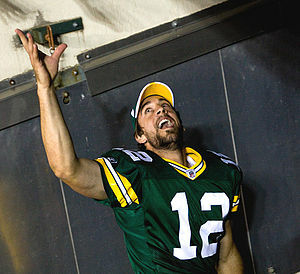 Who do you think will be the NFL’s breakout superstar of 2011? Leave a comment below. We’re going to start a new series today that will allow us to keep talking football while the lockout drags on. In this series, we’re going to look at free agents and try to match them to their perfect fits. We’ll consider opportunity, skill specificity, personality, and even money as we do this. We start today with Matt Hasselbeck, the Seahawks quarterback who will hit free agency if it ever begins. With each of these entries, we’ll give a quick synoposis of who the player is at this point, and then seek to find a fit. If you’d like to suggest a player for finding a fit, leave a comment or let us know on Twitter. Synopsis: Hasselbeck is the only quarterback on the free-agent market this offseason who has the talent to be a playoff-quality starter. He has led the Seahawks to six playoff appearances, including one last year, and one Super Bowl in his 10 seasons with the team. While Hasselbeck isn’t the most physically gifted guy, he’s a quintessential West Coast offense quarterback who can spread the ball around and make enough deep throws to keep defenses honest. He’s also a solid locker-room leader who has the kind of personality that a team rallies around. At age 35, Hasselbeck is in decline (his last great season was in 2007), but with a better supporting cast than the Seahawks provided last year, he still could be an above-average NFL starter. Seattle – The Seahawks reportedly called Hasselbeck during the one-day lockout lift around the draft to reiterate the fact that they want him back. It makes sense, because Hasselbeck has been a solid starter for the team for a decade. But Seattle has a lot invested in Charlie Whitehurst – both in terms of money and draft-pick equity – and Hasselbeck may have been turned off by the lack of an earlier offer or by Pete Carroll’s decision to trade for Whitehurst last year. Still, though, Seattle is one of the few places where Hasselbeck could still be a two- or three-year starter, which has to enter into his thinking. Arizona – The Cardinals didn’t draft a quarterback of the future this year, which means they’re hitching their developmental QB wagon to John Skelton and Max Hall for another year. So the Cardinals need a veteran. They’re rumored to prefer Marc Bulger, but Hasselbeck will at least be on their call sheet. With Hasselbeck in place, the Cardinals should be able to stabilize their horrific offensive performance from 2010, which could be enough for them to contend in the mediocre NFC West. But it’s not a West Coast system, which means that Bulger’s probably a better fit for the offense than Hasselbeck would be. Throwing to Larry Fitzgerald would be tempting, as would the chance to be a starter beyond 2011, but this isn’t a perfect fit for Hasselbeck. Miami – The Dolphins don’t seem to be in love with incumbent starter Chad Henne, but they didn’t draft a replacement for him, and 2010 competitor Chad Pennington has fallen apart physically to the point that he’s no longer an option. Hasselbeck is good enough to push Henne and potentially to keep a team with a solid if unspectacular roster in the playoff hunt. Throwing to Brandon Marshall, Davone Bess, and crew and playing behind a top-notch offensive line would be appealing to Hasselbeck as well. The system fit isn’t perfect, but Hasselbeck’s probably the best option for Miami if they want to add a vet who could potentially beat out Henne. That makes this fit an intriguing hypothetical. Washington – Under coach Mike Shanahan, the Redskins are a prototypical West Coast offense team. That’s a fit for Hasselbeck; however, the rest of the situation isn’t. The Redskins don’t protect quarterbacks very well, which is a warning sign for a QB like Hasselbeck who has had some injury problems of late, and they also have a young and unproven receiving corps. Plus, the Redskins seem to think more highly of holdover John Beck and free agent Rex Grossman than others do, which would discourage them from adding Hasselbeck. So even if the Skins jettison Donovan McNabb, as expected, we don’t see Hasselbeck fitting in as the veteran du jour. 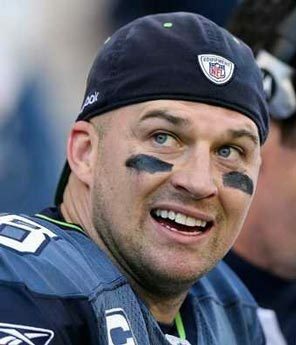 San Francisco – Per @sportsbarbanter’s suggestion, the 49ers could be a nice fit for Hasselbeck if 2011 is the prime option. Hasselbeck would be a better bridge quarterback to incoming rookie Colin Kaepernick than incumbent Alex Smith, which could put the 49ers in position to contend for a division title. But if the 49ers are indeed committed to bringing Smith back, Hasselbeck will look elsewhere. He won’t want to compete for a starting job in a place where the QB of the future could surpass the winner within a year. Minnesota – If Hasselbeck wants to be a bridge candidate, Minnesota makes far more sense. The Vikings run a West Coast style system under offensive coordinator Darrell Bevell, and they have enough weapons – Percy Harvin, Visanthe Shiancoe, and of course Adrian Peterson – to be an attractive 2011 landing spot. The Vikings tend to be leaning toward throwing 2011 first-rounder Christian Ponder right into the fire, but if they call Hasselbeck, it’s worth his time to listen. Tennessee – NFL.com’s Mike Lombardi made this suggestion, arguing that Hasselbeck would be a perfect stopgap while rookie Jake Locker develops. Hasselbeck could certainly do it, and new offensive coordinator Chris Palmer’s system relies on accuracy. But aside from Kenny Britt, the Titans don’t have elite receivers, and that makes us think moving to Nashville could yield nothing more than an average season for Hasselbeck. Thus, this isn’t Hasselbeck’s best stopgap landing spot. Carolina – The Panthers are the other team with a rookie QB that could look for a placeholding veteran. But Carolina has even more motivation to start its rookie, first overall pick Cam Newton, from day one, which keeps this from being an attractive option for the veteran. Plus, Carolina’s receiving corps may be even worse than Tennessee’s, especially if Steve Smith raises a big stink and gets out of town. We put this fit in the no-chance category. Oakland – The Raiders don’t seem like a perfect fit for Hasselbeck, but you never know what they’ll do. The deep-ball centric system doesn’t maximize Hasselbeck’s talents, but head coach Hue Jackson is a good enough play-caller that he could cater to the veteran. But with Jason Campbell already on board, and free agent Bruce Gradkowski a solid option to pair with him, the Raiders likely won’t find it worth it to pony up enough money to get Hasselbeck’s attention. In the midst of the NFL lockout, one rumor that won’t go away is that the Eagles are looking to deal backup QB Kevin Kolb to a team that wants to make him a starter. Kolb, who is signed to a reasonable contract and who sits behind Michael Vick on the depth chart, says he’s ready to start, and his performance in fill-in performances supports that belief. And Eagles head coach Andy Reid seems open to granting Kolb’s trade wish if the price is right. But is this wise for the Eagles? And is trading for Kolb a good move for a quarterback needy team? Let’s do a research project to see the results other trades in which teams dealt for someone else’s backup quarterback and made him a starter. *If you can think of an example we forgot, leave a comment and we’ll add it in below. 2010 – Chargers trade Charlie Whitehurst and 2010 second-round pick (60th overall) to Seahawks for 2010 second-round pick (40th overall) and 2011 third-round pick – Whitehurst, a former third-round pick, was never going to surpass Philip Rivers in San Diego, but he had also fallen behind vet Billy Volek on the depth chart. So when the Seahawks wanted Whitehurst to compete for their starting job, the Bolts made the deal. The Seahawks didn’t give up as much as other teams had for QBs they knew would start for them, but it was a fairly hefty price for an unproven backup. In his first year in Seattle, Whitehurst couldn’t beat out veteran Matt Hasselbeck, and he started just two games. While his numbers weren’t great, he did lead the Hawks to a Week 17 victory over St. Louis to clinch a playoff spot. Hasselbeck is now a free agent, and the Seahawks want to keep him, which speaks to Whitehurst’s current value. But the jury is still out on whether Seattle got what it paid for in this deal. 2009 – Patriots trade Matt Cassel and LB Mike Vrabel to Chiefs for second-round pick (34th overall) – Cassel, who had been a backup at USC and with the Patriots, got his chance to play in 2008 when Tom Brady suffered a season-ending injury in Week 1. Cassel acquited himself well, to the point that the Patriots put the franchise tag on him after the season. That was really a move to protect his value, and New England soon traded Cassel to Kansas City for an early second-round pick. That was a pretty nice return on investement for the Pats, who were obviously going to turn back to Brady as their starter. Cassel struggled a bit in his first year as a starter, but he really came on in 2010 to show he can be at least an above-average NFL starting QB. At this point, K.C. has to be thrilled to have Cassel, even after paying a hefty price. 2007 – Falcons trade Matt Schaub and 2007 10th overall pick to Texans for 2007 8th overall pick, 2007 second-round pick, and 2008 second-round pick – This is the one example that worked out far better for the team acquiring the backup quarterback. Schaub had started two games behind Michael Vick in Atlanta before the Falcons were able to get a pretty nice ransom for the former fourth-round pick. Schaub went on to the Texans, where he supplaned disappointing No. 1 overal pick David Carr. Schaub has developed into a prolific passer and has started every game when healthy over the past four seasons. The Falcons, meanwhile, didn’t know that their first season without Schaub would also be their first season without Vick, whose legal troubles began that year. So under first-year head coach Bobby Petrino, Atlanta started a poo-poo platter of Joey Harrington, Chris Redman, and Byron Leftwich that season. Petrino bailed and went to Arkansas, and the Falcons ended up drafting Matt Ryan as their new franchise QB. Atlanta bounced back from this trade, but it was as disastrous at first for the Falcons as it was shrewd for the Texans. 2004 – Eagles trade A.J. Feeley to Dolphins for 2005 second-round pick – Andy Reid learned from Ron Wolf, the GM of the team he had been an assistant coach for, when it came to trading quarterbacks. So once Donovan McNabb was an established starter, Reid dealt third-stringer Feeley to the Dolphins for a pretty high price – a second-rounder. Feeley had been a fifth-round pick, but when McNabb and backup Koy Detmer were injured in 2002, Feeley went 4-1 as a starter, helping the Eagles land a playoff berth. He was stuck on the bench another year before the Dolphins anted up to get him. But Feeley started just eight games in Miami and played poorly, losing the starting job to Jay Fiedler as coach Dave Wannstedt got forced out. Within two years, Feeley was gone. The Eagles, meanwhile, got WR Reggie Brown out of the deal as a draft pick, and actually got Feeley back as a backup a few years later. Philly won in this deal, and Miami definitely lost. 2001 – Packers trade Matt Hasselbeck plus 2001 17th overall pick and seventh-round pick to Seahawks for 2001 10th overall pick and third-round pick – Hasselbeck was the third Packers backup under Brett Favre who was traded to become a starter elsewhere, and he was the most valuable. For one, GM Wolf had built up the value of his backups enough to show that they were worthwhile investments for trading partners. Plus, the Seahawks made the trade under GM/coach Mike Holmgren, who had been in Green Bay when Hasselbeck was drafted in 1998. Hasselbeck was a sixth-round pick who developed into a preseason star in Green Bay, but he was never going to get a chance to start with Favre in place. So he moved on to Seattle. It took a while for Hasselbeck to beat out Trent Dilfer for the starting job in Seattle, but Hasselbeck eventually developed into a three-time Pro Bowler who led the Seahawks to several playoff berths and one Super Bowl. The fact that Seattle lost just one draft pick (a third-rounder) while giving up a few spots in the first round was a solid investment. Both teams came out of this deal as winners. 2000 – Packers trade Aaron Brooks and TE Lamont Hall to Saints for 2001 third-round pick and LB K.D. Williams – Brooks was the Packers’ third-string quarterback as a fourth-round pick out of Virginia, but after a year Ron Wolf was able to deal him to New Orleans for a third-rounder. The move was worthwhile for the Saints, as Brooks became a starter his first year and ended up starting 82 games for the team. Meanwhile, the Pack once again took advantage of Favre’s durability and turned a backup quarterback into a better pick than the one it had spent on him. So this deal was another win-win. 1999 – Broncos trade Jeff Lewis to Panthers for 1999 third-round pick and 2000 fourth-round pick – The Panthers, looking for a franchise quarterback, dealt for Lewis, who was a former fourth-round draft pick who was backing up John Elway in Denver. But Lewis couldn’t beat out veteran Steve Beuerlein in Carolina. Lewis was a backup for two years, in part because of a severe knee injury, getting only nominal playing time after the Panthers were eliminated from the playoff chase in 2000. And after George Seifert cut Beuerlein following the 2000 season to clear the way for Lewis, he fell flat on his face and was released at the end of training camp. The Panthers, led by rookie Chris Weinke, fell to 1-15 in 2001. The Broncos, meanwhile, dealt Lewis at the top of his value, because they already knew that Brian Griese had surpassed Lewis on the depth chart. After Elway’s retirement in 1999, Griese surpassed Bubby Brister and became a four-year starter for Denver. Denver fared fine in this trade, but it was a disaster for the Panthers. 1995 – Packers trade Mark Brunell to Jaguars for 1995 third-round pick and 1995 fifth-round pick – Brunell, who had spent two years backing up Brett Favre in Green Bay, was Jacksonville’s choice as their franchise quarterback for their first season, despite the fact that he had thrown just 27 NFL passes. It was a great move for the Jags, who got a three-time Pro Bowler for a very reasonable price. The Packers, meanwhile, had figured out that starter Favre was not just a Pro Bowl player but also an iron man who wouldn’t miss any time. So Wolf turned Brunell, a former fifth-round pick, into third- and fifth-round picks. The deal ended up as a win-win for both sides.